The Double Doodle, one of 26 Brain Gym® activities, is a drawing made using both hands. You can do a Double Doodle in the air, on paper, or even on someone else’s back (it’s calming, relaxing, and comforting!). There are many kinds of Double Doodle*, but most of them are created by drawing a symmetrical design, with the hands mirroring each other side by side. 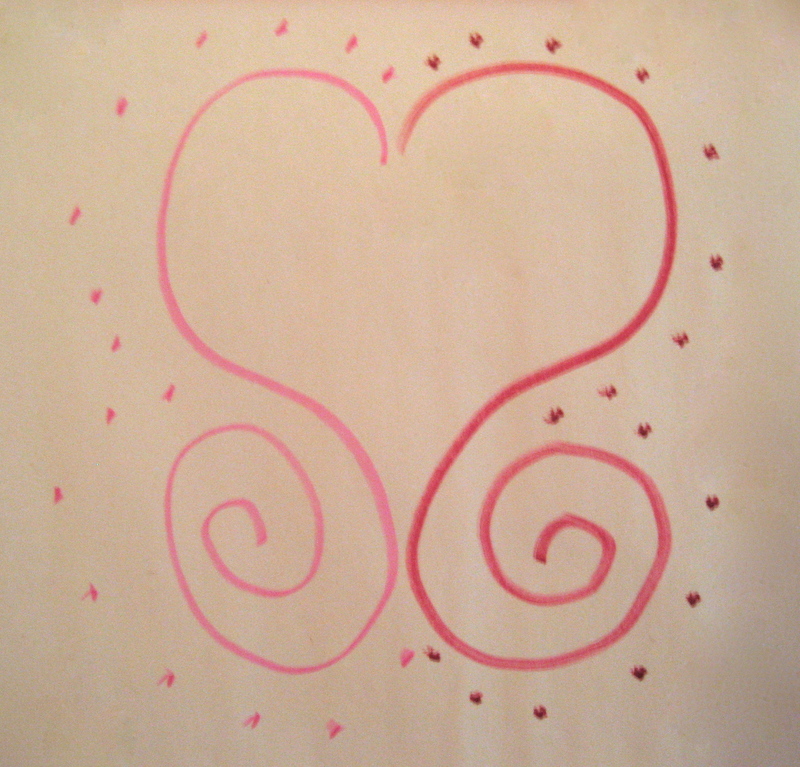 The heart-shaped Double Doodle design shown here is a simple and easy doodle with which to start exploring the fun and benefits of making mirror-image marks. If you are new to the Double Doodle, I suggest standing and using a large sheet of paper—on a flipchart or taped down vertically on a tabletop. In Brain Gym, when possible we connect with a whole-body (proprioceptive) context for using our hands and eyes. So before beginning, do a few repetitions of the Cross Crawl. By letting your arms swing freely as you move, you can use the Cross Crawl to relax your arms and hands for a more free-flowing Double Doodle. Next, center your body in alignment with the vertical midline of the page (if you need to more clearly distinguish the midline, you can make a vertical fold in your paper). Now place both hands near the vertical midline of the paper. Notice how your hands are now automatically centered with your body and also with the page. Now let your hands move slightly up and out, as if to make two large circles, then down, in, down some more, and around, circling in the opposite direction to finally come to rest in the inward spiral. Let go of any need for yours to look like this one. Most often, Double Doodles are unique to the individual. Let your drawing surprise you! Notice how the brief and expansive upward and outward shape of the movement gently balances the downward and inward spiral. Using large motor movement in gravity like this, the shoulders and elbows easily relax as we let our hands flow alongside one another in their natural movement: down the page on the flip chart, or toward us on a flat surface—the entire motion taking only seconds to complete. Notice also how doing the Double Doodle engages your large muscles in a smooth motion (there is almost no motion at the wrist), without the strain or tension on fingers and wrists so often associate with drawing or writing. Many people feel their eyes relax, as well. Even though the spirals at the bottom of the heart go in opposite directions, they seem to help one another flow, and here on the right is the counterclockwise motion that starts the letter “o” that children often struggle to make. After drawing the shape, people often want to begin again at the top, or sometimes to draw it from the bottom up, in which case you’ll most likely complete the final stroke with your hands opposite your sternum. From here, for a moment, there’s nowhere to go, nothing to do. It’s a good place to pause—a place of completion and new beginning. For fun, I added small tapping marks around the shape. 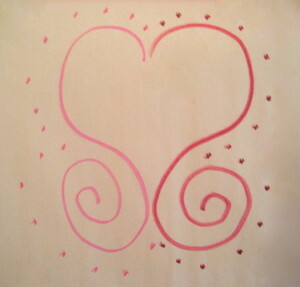 This simple heart shape that you’ve just drawn, with its spiraling base, is common to much American folk art. To make it more elaborate, you can add flourishes, additional spirals of various sizes, or a slightly larger shape to mirror and encompass the first. And now that you know how to make this basic heart template, you can also adjust it in size or shape to create many other heart-shaped structures. Paul first learned to do bilateral drawing in the early 1970s when he read developmental optometrist G.N. Getman’s book How to Develop Your Child’s Intelligence, an insightful classic that is still available and full of great suggestions for parents. Paul began using “bilateral drawing,” as Getman called it, with the students at his Valley Remedial Group learning centers. 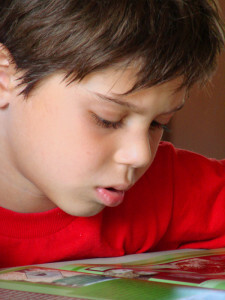 He found that the activity helped learners develop essential skills of tactility (you can experience that by tracing your completed drawing with your fingers), hand-eye coordination, and directionality, as well as visual discrimination for reading. Directionality means knowing one’s orientation in space—knowing where up, right, left, and down are in terms of the center of one’s own body. As you can see and experience, the body’s midline isn’t something imaginary, any more than the midline of a page is an approximation. And the exactitude of the body’s midline, immediately identified through movement, supports the accuracy of the bilateral motions of the eyes needed for reading and writing, supporting as well all the turning motions of the head. When Paul later met Dr. Getman, they discussed what was then 30 years of optometric research on learning that had yet to be implemented in the classroom (it’s now been 70 years, and this research is still largely overlooked today). They also talked about how children’s perception depends on their movements that define their orientation, location, and differential manipulation, and how learning disabilities in basic school subjects are wholly preventable through the effective teaching of movement of the body, eyes, and hands. And when you did the Double Doodle, were you aware of moving in new ways by letting one hand mirror the movement of the other? Today, research is further investigating how novel, voluntary movement supports cognition and neuroplasticity. When Paul and I began selecting the Brain Gym® activities to use in our 1986 book: Brain Gym®: Simple Activities for Whole-Brain Learning, we had already been teaching our own free-form variety of two-handed drawing, as described above, that we called the Double Doodle (Getman’s original bilateral activity was more structured). Classroom learning tends to emphasize one-sided movement of eyes and hands, yet we see every day how doing the Double Doodle for even a few minutes helps learners experience two-sided (bilateral) integration with hands and eyes working together in synergistic collaboration. *The Double Doodle is one of 26 Brain Gym activities from Brain Gym®: Teacher’s Edition by Dennison and Dennison, ©2010. The introductory course Double Doodle Play: A Window to Whole-Brain Vision offers a full day of exploration built on mirror-image mark-making and painting. The Double Doodle and other Brain Gym activities are taught in Brain Gym 101: Balance for Daily Life. ** See Research Nugget: Visual Skills and Reading. Brain Gym is a trademark of Brain Gym® International/the Educational Kinesiology Foundation. Click here for the name of a Brain Gym or Double Doodle instructor near you. Halloween Magic with Two-Handed Play! Stand Up . . . Sit Down . . . Can You Do It? Michael had heard about my work helping people achieve improved balance and coordination, so he brought his father, Joe, to see me. In the last few years, Joe, 85, had become almost completely sedentary. His recent fall had prompted increased concern about his condition. Whenever he got up to walk, he was using two canes to keep his balance. When Joe arrived at my office, he seemed tired and preoccupied, and made little eye contact. He needed assistance to seat himself. As Michael and I began to talk with him, Joe immediately closed his eyes, lolling his head sleepily to one side. With Michael’s help, I facilitated the setting of a goal with Joe: “To move, laugh, and enjoy life.” From the learning menu we chose Dennison Laterality Repatterning (DLR), a simple movement process at the heart of my work. Lying back on a massage table, Joe was at first unable to raise his arms or legs without assistance. So I asked him to look up to the left as we helped him do the contralateral Cross Crawl movements, alternating in the lifting of each leg and opposite arm. At first the process was difficult for Joe. Yet after some repetitions he suddenly began to lift each leg and opposite arm by himself. “Good job!” we said, as Joe reclaimed the movement pattern and participated with increasing vigor. When the repatterning was complete, we all three laughed as Joe looked around the room, boldly slid off the table, and walked across the room without reliance on his canes, moving in a rhythmic gait and swinging his arms reciprocally. I asked if he could seat himself without help, and he did so. “Now stand up,” I requested, and he easily rose to his feet. I told Joe that the best exercise he could do for himself was to stand up and sit down again often throughout the day, finding his balance, walking from place to place, and looking into the distance for destinations to move toward. I also gave him a few Brain Gym® homeplay activities to help him integrate the new movement patterns. Michael and I were happy to help Joe “wake up” to more movement, laughter, and enjoyment. For the restoration of his whole-body movement map, Joe’s repatterning seemed a strong beginning. He now seemed better able to keep his balance, locate himself spatially, and hold up his head as he moved his eyes to look around. Scott McCredie, in his book Balance: In Search of the Lost Sense, hypothesizes that the sense of balance is so essential to human survival and functioning that we have evolved with three distinct balance systems: (1) the visual, for locating ourselves in space; (2) the vestibular of the inner ear, for monitoring our head movement as we turn left and right; and (3) that of muscular proprioception, for continuous awareness of body movement in space. Good balance, says McCredie, depends upon the interrelationship of these systems. When, in 1981, I had the inspiration to create the DLR process, I was focused not on how to activate vestibular balance but on helping an adult nonreader learn to read. Yet today I believe that one reason DLR is so effective is that it helps coordinate vision, proprioception, and vestibular balance for cross-motor as well as one-sided movement. I also see how, after doing DLR, people are better able to access coordinated movement, visual flexibility, and clarity of cognition. It makes sense to me that organized sensorimotor programs help free the eyes and mind to seek new information, rather than be always seeking balance. See more about Scott McCredie’s book. Today we completed a rousing Optimal Brain Organization (OBO) workshop. A primary theme in the OBO course is how, when people are under stress, they lose their bilateral integration and become more one-sided. They are then unable to cross the lateral midline or access the processing midfield, where eyes, ears, and hands ideally work together. I theorize that such a one-sided imbalance is a compensation stemming from a lack of large-motor movement developmentally (prior to school age) or during the school years. In other words, kids are sitting too much. Therefore they’re not developing the muscle tone and integrated muscle systems that would let them access both sides as a balanced context for one-sided drawing and handwriting. Another theme of this course is that the transfer of learning is not automatic and must be taught. The course is built around playful balances that help students reconnect with their eye teaming, head turning, and two-handedness as well as symmetrical whole-body movement. Through balances, they learn to transfer learning from one area of expertise to another. I explained that the reciprocal back-and-forth motion of thumb and fingers in a relaxed state is needed to form the fluid clockwise and counter-clockwise curves of handwriting. The students joined in a discussion about the importance of bilateral integration over one-sided processing and then eagerly explored this processing for themselves in their own balances. Like all Edu-K courses, the OBO course is taught in an experiential, whole-to-parts approach. I have been teaching about dominance profiles since the 1970s, when I first tested for them in my learning centers. This particular course was originally built (in 1996) on the works of a number of leading-edge researchers such as Springer and Deutsch, who wrote Left Brain, Right Brain: Perspectives from Cognitive Neuroscience (1989; 2001); Edward Le Winn, author of Human Neurological Organization (1977; 1997),and Gerald Leisman, who authored Basic Visual Process and Learning Disability (1975),along with other researchers with whose books I became familiar in the early years at my learning centers, soon after completing my dissertation. These works have translated well into the practical application we use in this course. In teaching the OBO course in more recent years, I draw from the wisdom of Frank Wilson’s definitive book The Hand: How Its Use Shapes the Brain, Language, and Human Culture. 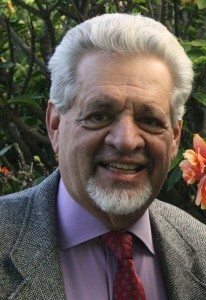 I include discussion of neuroscientist Elkhonon Goldberg’s revelations in The Executive Brain: Frontal Lobes and the Civilized Mind, as I believe that it’s imperative for parents and educators to be aware of the executive brain functions that are maturing in their students and to know ways to nurture such functions. And all Brain Gym® Instructors are familiar with Carla Hannaford’s informative book The Dominance Factor: How Knowing Your Dominant Eye, Ear, Brain, Hand & Foot Can Improve Your Learning, which details the linkages between the side of the body we favor for seeing, hearing, touching, and moving and the way we think, learn, play, and relate to others. In her book, Hannaford recommends specific Brain Gym activities to cultivate each learning profile. My latest reference for this course is the authoritative book on left and right brain: The Master and His Emissary: The Divided Brain and the Making of the Western World, by renowned U.K. psychiatrist and writer Iain McGilchrist. In class, we watched the RSA Animate of a Ted Talks lecture by McGilchrist. Click here to find a summary of the animate, and a link to it.